Yes I know, it's made by a new guy on the block. I'll give some credit to Assembler's first project: his solo effort has some positive qualities. 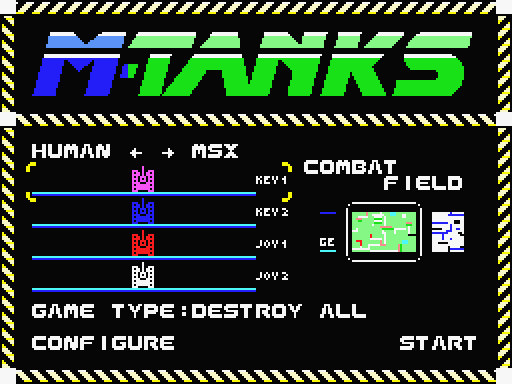 M-Tanks is clearly meant as an update to Atari 2600's Armor Ambush. 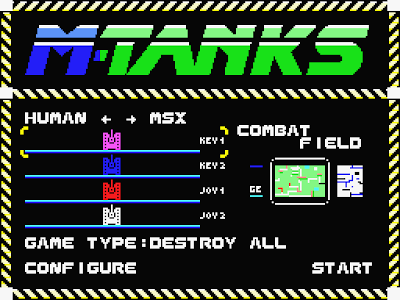 (I wonder if the "M" in M-Tanks is for the old developers 'M Network'?) In a sense it does play like a long-lost sequel, with expanded multiplayer support, a good variety of levels and modes; it oozes with a sense of purpose. But despite all this, it's marred by some bad design choices. There isn't any one huge problem holding the game back; it's more like a death by a thousand cuts. In my effort to be kind, I'll allow that perhaps some missteps are intentional design decisions to invoke the era. Although, to be honest, even that doesn't make me feel much kinder towards it. Let's start with the graphics. It's occasionally difficult (and frustrating) to tell where walls begin and floors end. The shadows blend seamlessly with some decorations and the walls possess no clear demarcations. Hell, if the tank is the same colour as the ground (such as playing the grey tank in the second level), you're literally invisible to yourself and opponents. I know the art style is intentional and this aesthetic isn't an accident, but the execution is irresponsible. It's thankfully not as eye-bleeding as it could be (Mecha 8, I'm looking at you) but that's not really a compliment. 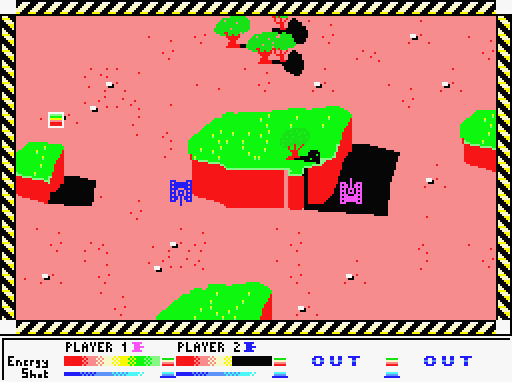 Then there's the snail-paced gameplay and painfully predictable combat. Again, this was likely intentional to give the impression of controlling a slow, heavily armoured tank. But what's the excuse for the horrible firing delay? Is the gunner radioing HQ for confirmation of his target before taking every shot? And are these explosive tank-destroying shells that are being fired, or tins of beans? The number of hits it takes to destroy your opponent suggests the latter. And if all that wasn't bad enough, you still have some pretty terrible AI for company. My suggestion? Find a friend. It's obvious that a lot of work and thought went into this game; I really wish it came together in the end - and maybe with a bit more playtesting and feedback from the MSX community it would have. 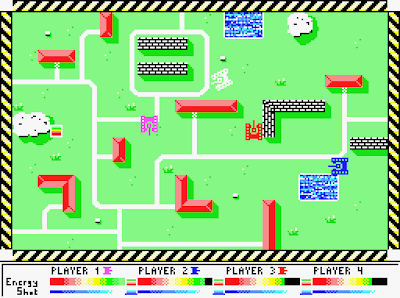 Assembler has shown with M-Tanks that he clearly possesses the necessary skill to make a decent game. I'm sure that if he continues to build on this, his next MSX project will fare quite a bit better.